Over 15 major U.S. companies laid off workers in 2016. For example, Macy's Inc. (NYSE: M) let 4,000 workers go last year. And Microsoft Corp. (Nasdaq: MSFT) laid off 2,800. Unfortunately, this trend is likely to continue into 2017, thanks to declining sales, poor foot traffic in brick-and-mortar stores, and the increasing popularity of e-commerce. Mass Layoffs in 2017 No. 1, Macy's Inc.: The iconic department store got rid of more than 5,000 jobs last year in an effort to save money and offset "disappointing" sales results, according to CNN Money in January 2016. One year later, the retailer is looking to repeat this move. Macy's announced it would be shutting down 68 stores and cutting 10,000 jobs in a press release on Jan. 4 in an effort to "streamline costs." Mark Cohen, a professor at Columbia Business School, told CNN Money on Jan. 4 that this is not the last time Macy's would make this type of announcement. "It's very hard for the folks involved obviously, but I would also say it's inevitable," Cohen said. "And there is definitely more to come." Holiday sales at Kmart and Sears stores in November and December were down by more than 12% from 2015 – fueling the need to cut costs, wrote CNBC. "Many of these stores have struggled with their financial performance for years and we have kept them open to maintain local jobs and in the hopes that they would turn around," said the company in a statement on Jan. 4. While we don't know the exact number of jobs that will be lost as a result of these closures, we do know that the store closings reflect 10% of Sears and Kmart locations. Mass Layoffs in 2017 No. 3, Wal-Mart Stores Inc. (NYSE: WMT): The "everyday low-price" store will be slashing over 1,000 jobs in January, as reported by USA Today on Jan. 11. "We are always looking for ways to operate more efficiently and effectively," Wal-Mart spokesman Greg Hitt said in a statement. "Like any organization, we make decisions based upon what's best for our business and the customers we serve." Wal-Mart is struggling to compete with online rivals like Amazon.com Inc. (NYSE: AMZN) as consumer preference for convenience continues into 2017. According to a December report by Slice Intelligence, retailers are hard-pressed to keep up with the e-commerce giant. Amazon accounted for 30% of sales during the recent holiday season, while Wal-Mart only brought in 4.1%. Mass Layoffs in 2017 No. 4, Lowe's Companies Inc. (NYSE: LOW): Lowe's announced on Jan. 13 it would be eliminating almost 3,000 positions in order to shift to a new store shopping model. The new model will be implemented nationwide and is aimed at freeing up resources to boost face time with customers as the retailer adapts to evolving customer needs, as reported by CNBC on Jan. 13. CNBC also reported that the home-improvement company is planning to allocate 45% of its spending in 2017 to developing a new online shopping model in an effort to attract and retain customers. Mass Layoffs in 2017 No. 6, Pandora Media Inc. (NYSE: P): Even U.S. companies that deal entirely with e-commerce are struggling to cut costs. Today (Jan. 13) Pandora announced that it would be eliminating 7% of its workforce in a move to save nearly $40 million in operating costs. The music-streaming company had 2,219 employees as of Dec. 31, according to Benchmark Monitor. The Oakland-based media company blamed increased competition and lack of sales for the cuts, wrote Bloomberg on Jan. 13. Perhaps the most interesting facet about Pandora's massive cut is that company CEO Tim Westergren publicly viewed its workforce as no longer a priority. "With our strategy fully crystallized, new products launching, and promising momentum in the core business, we are prioritizing the highest-value opportunities and deprioritizing others," he wrote in a statement about the layoff to shareholders. Mass Layoffs in 2017 No. 7, Fitbit Inc. (NYSE: FIT): The wearable fitness tracker company announced in a press release on Jan. 30 it would be slashing 6% of its workforce, or 110 employees, as part of a greater restructuring of the business. The corporate restructuring comes as a result of lower than expected demand for its products in mature markets like the United States, Yahoo reported on Jan. 30. "To address this reduction in growth and what we believe is a temporary slowdown and transition period, we are taking clear steps to reduce operating costs," James Park, chief executive of Fitbit, said in the release. Fitbit's stock plunged more than 13% after the news – from $7.22 down to just $6.28 a share. Mass Layoffs in 2017 No. 8, Hershey Co. (NYSE: HSY): The infamous American chocolatier announced it would be cutting 15% of its workforce on Feb. 28. The company said in a statement that the move is part of a multiyear program to improve profitability. "Our objective is to ensure that we always have the right level of innovation, marketing plans, and consumer and customer expertise to drive net sales growth," said incoming CEO Michele Buck. In after-hours trading following the announcement, Hershey's shares fell by nearly 7%. 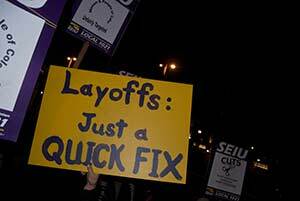 For more information on U.S. companies laying off worker en masse, follow Money Morning on Facebook and Twitter. I spoke about world brick and mortar trade every where becoming a mess months ago the introduction of the most organize trader on earth Amazon sell deliver in lighting speed is what the world wants sit at home do nothing trade on line surf price and play dice, every one is a winner if all the online traders in this world want to be in it to win it you have to DELIVER once again I see all malls thru out this planet turning space into storage sheds for delivery rear roller doors appearing every where .